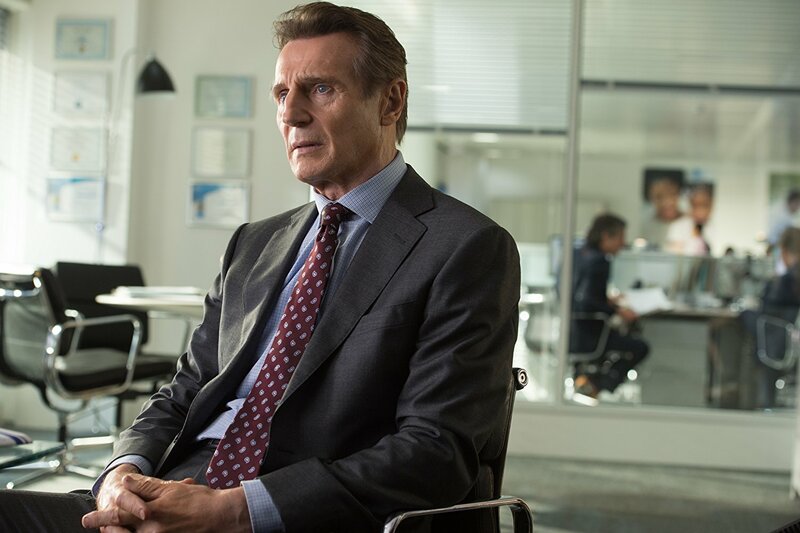 In their fourth film together, director Jaume Collet-Serra and Liam Neeson have seemingly set the bar too high with their previous three efforts that include Unknown, Non-Stop, and Run All Night to make this as enjoyable as it probably is. You may also be familiar with Collet-Serra's style via last summer's sleeper hit The Shallows, but while the expert B-movie director and his late-in-life action star may have proved to be a collaborative dream team in the past when it came to crafting guilty pleasures the excitement within the relationship seems to have worn off a bit with their latest, The Commuter. It's funny because everything one could hope for from a Collet-Serra/Neeson collaboration is here in terms of the plotting, tension, and action spectacle, but while it is evident from the opening title sequence that Collet-Serra is going for something a little more nuanced than a movie like The Commuter might actually deserve the film ultimately falters in this ambition as it ends up feeling rather hastily put together via a rookie screenwriting duo (Byron Willinger and Philip de Blasi) that was then seemingly revised by Non-Stop screenwriter Ryan Engle. This makes sense given The Commuter is more or less Non-Stop on a train, but no matter how little or how much effort was initially put in by Willinger and Blasi and/or how much of an overhaul Engle ended up doing the biggest problems with The Commuter still boil down to the screenplay and its slight excuse of a story. One can feel Collet-Serra attempting to infuse this thing with style and nuance as well as Neeson giving everything he seemingly has left in his aging body that might inspire him to continue the fight. The veteran actor is frazzled though, and that mentality is kind of present from the get-go. 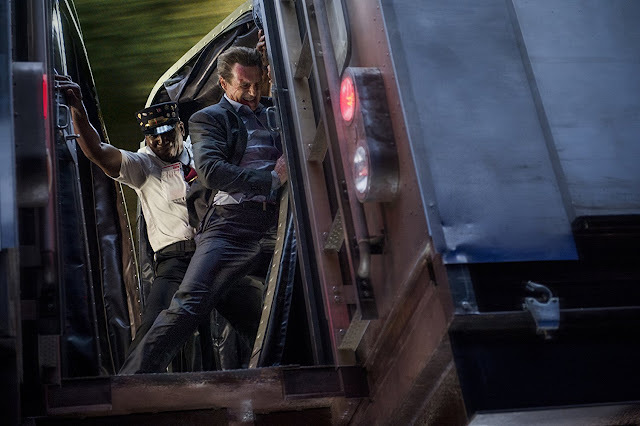 At this point we know the routine and we understand the stakes-The Commuter needed to do something to break the monotony as Run All Night did exceptionally well as compared to this, but instead this latest in the long line of varied actioners that compose Neeson's career resurgence as an action star is a middle of the road effort; something that looks the part and acts the part, but doesn't feel authentic in its portrayal of what it's actually supposed to be. Michael MacCauley (Liam Neeson) receives some bad news at work upon our meeting him. 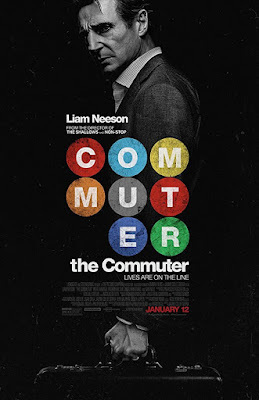 So yeah, in The Commuter Liam Neeson is an insurance salesman who commutes to work every day and through the course of the day we find out that not only has the poor guy, named Michael MacCauley, been let go, but also that he is a former cop who worked alongside Patrick Wilson's Alex Murphy for some time before retiring for reasons that don't seem to ever be made clear. This may or may not have something to do with the stock market crash of 2008 when MacCauley and his wife, Karen (Elizabeth McGovern), lost all of their savings, retirement, etc. making it difficult for them at the moment as their only son is getting ready to go away to college. This is all weighing on MacCauley's shoulders as he boards the train to head home. As such events might go, MacCauley is then approached by a mysterious woman named Joanna (Vera Farmiga) who offers the vulnerable MacCauley a proposition he is unable to refuse. Joanna sets it up by phrasing it as an able task for an ex-cop that requires Neeson's character to track down a certain passenger of which all he knows are the person's name, their stop, and that they are carrying a bag. If MacCauley accepts he can have the $25,000 that has been stashed in one of the compartment restrooms and if he completes the task successfully he will gain an additional $75,000. Not a bad deal considering all he has to do is identify a person and given his current circumstances. Naturally, things are a bit more insidious than Joanna initially lets on as Farmiga's character gives no reason for her visit, no idea as to her intent, or who she works for beyond her profession that entails reading different people and their personalities. This would hint at an interesting road for the film to take; Neeson's character getting to know different riders on the train so as to use deductive reasoning to narrow down the suspects and figure out who he is supposed to be escorting to whoever Joanna works for, but from the get-go MacCauly is more anxious than he is thoughtful leading to a series of over-aggressive, unplanned, and easily regretful mistakes that MacCauley doesn't seem to give a second thought to. This all quickly devolves into Neeson using his former cop skills to do some detective work that feels so sporadic there is no meaning or connective tissue to which the plot then seemingly realizes it has to answer these odd, but convenient in terms of intrigue questions in order to iron out the third act and so rather than a bonkers race against time The Commuter becomes an exposition dump that doesn't mesh with the director and star's prior efforts. You might be thinking that if my qualms are around the weakness in plot and that plot's execution that I'm missing the point of these annual Neeson actioner's, but I assure you that is most definitely not the problem as I've often embraced these excursions for exactly the reasons of them being able to execute a rather thin or weightless plot in a manner that is exceedingly engaging and ultimately smarter than one might initially give them credit for. I was naturally hoping to do the same with The Commuter, but this one isn't enough fun to excuse what might be the most blatant in terms of lazy storytelling. Again, this is largely from a perspective of a guy who thought Run All Night was the best of the Neeson/Collet-Serra collaborations and was therefore looking forward to what this next film might entail as that previous picture broke away from the polished and perfected glean of both Unknown and Non-Stop while still squarely fitting into a genre. Run All Night was dirty and grimy and while recognizable as a certain kind of film, it didn't necessarily adhere to any one set of expectations. To be fair, The Commuter doesn't necessarily adhere to any kind of expectation considering it exists within the same B-movie genre as those aforementioned films, but it doesn't fulfill any of them either. There are some attempts by the script to be about something more just as there are obvious strides taken by Collet-Serra to make what was on the page stand out, but while the premise is intriguing enough and the direction precise in working with what it has to work with the final product simply isn't as thrilling, interesting, or fun as it should be. This isn't even a case of expecting the film to be one thing and it failing to meet those expectations by being something entirely different, but rather it is a film that attempts to be both a rehash of what we've seen these collaborators attempt before by enlisting a different tone and a set of more vague plot devices that doesn't end up working in any entertaining fashion. Maybe that's a little too harsh as, before you find out what the deal is with Neeson having to track down this particular individual in order to save his floundering financial life there is some intrigue and it's always fun to watch as Neeson's domineering presence integrates itself with others and how his special brand of justice goes about achieving his objective-even if the screenwriters set-up one way of deriving such information and then completely abandon it in the face of Liam Neeson: action hero! MacCauley is tasked with a mysterious objective in The Commuter. If this is disappointing news to you, trust that it was disappointing to this reviewer as well. The Commuter is a film that pitches Neeson as this ex-cop turned insurance salesman that is a generally good husband and an invested father (he reads the books his son has been assigned in school so they can work through essays and book reports together) and so we get this very middle class sense. This idea that the film is really wanting to hit home the everyman quality of MacCauley that is evidenced even further by the first extended piece of dialogue Neeson spouts in the film. There is a sense that Neeson is simply trying to make it paycheck to paycheck while putting enough away to save for his son's college tuition and catch-up on the retirement he and his wife may no longer be able to enjoy as blissfully as they expected. This stands to reason as, once MacCauley boards the train and the movie introduces us to the fellow passengers-both in the ones MacCauley knows from his time commuting and those he is unfamiliar with-there is very much this spirit in the themes of the movie that tell the audience it's a corrupt world and that there is no room in this world for the little guy to get a piece of the pie. This mentality even that, despite being a soldier for a good cause that a lot of the time more soldiers end up casualties than they do heroes who prevail for the cause they were intially fighting for. It's a pessimistic view to have, but not completely wrong or as easily dismissed as most would like to believe it to be. The best line in the film references an old Irish saying that goes, "If you want to know what God thinks of money, look at who he gives it to." It's a solid jab and it works in the context of what the movie essentially becomes in that of a rallying cry for good people to do the right thing instead of fall to the greed or corruption of a system that only seems to reward those who are out only for themselves. This is all well and good, but for a movie that begins as a mystery based around one man's ability or inability to assess those around him and not simply judge these books by their covers that becomes an off the wall action/thriller where the action is spastic and the thrills minimal The Commuter is a movie that time and time again doesn't manage to deliver on its own promises or follow through on its (not so big, but honorable) ideas. Wilson and Farmiga are both criminally underused here with the obvious joke that this isn't actually a tie-in to The Conjuring universe no doubt already being told many times, but still disappointing it doesn't pull a Split-like mid-credits reveal as that might have made this underwhelming crime drama more satisfying. At least the movie credits its own circumstances to be as outrageous as they indeed are hinting that maybe next time Neeson and Collet-Serra will be ready to truly go off the rails in the best way possible.